Get out! Father Merrin (von Sydow) has a chat with the demons who have taken over little Regan (Blair). Review by Rich Cline People who call The Exorcist the scariest movie of all time must not get out much. It's creepy, genuinely disturbing and thoroughly wrenching ... but it's not scary! As it gets into the minds of its characters, it finds powerful suspense and drama. And a startling examination of how we can never really understand the nature of mankind ... or God. Chris MacNeil (Burstyn) is an actress on location in Georgetown with her lively, funny daughter Regan (Blair), who suddenly starts acting very strange indeed-- blue-streak swearing, green-goo spitting, levitating, head spinning and now spider stair-walking. After seeing a raft of doctors and psychiatrists, Chris turns to Father Karras (Miller) for help to exorcise the demonic spirits. 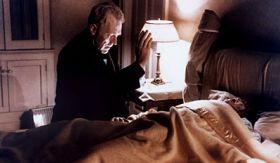 But Father Karras is struggling with his own faith. And it's not until the older world-traveller Father Merrin (von Sydow) shows up that things finally start to change. The performances are all so natural and realistic that we're drawn into the film hook, line and sinker, which makes the horrific goings on even more deeply affecting. Regan's gruesome behaviour is the stuff of nightmares (and cinematic legend! ), and Friedkin spends considerable time setting everything up so that each payoff has a much more powerful, visceral impact. The director's cut restores 11 minutes of footage to the film, along with an all-new sound mix and a few new effects shots. Surprisingly, this doesn't make it a bigger, more spectacular thriller; rather, it's now a more profoundly personal experience both for the film's characters and for us as an audience. A classic film in every way. But it's not that scary! At least I'll keep telling myself that.